Professional photographers and keen amateurs almost always carry more than one camera and this new strap from Black Rapid can not only carry two in comfort but is suited to smaller framed people. The BlackRapid DR-2 Slim Double Strap will carry two cameras or lenses vertically at the side. Two locking FastenR3 connect the straps to the tripod socket located on either the camera body or the lens. Once connected, the cameras hang upside down, resting securely at the side of the body. Detach half and use it as a single R-Strap. The RS-DR2 double strap fits men and women. The difference between Black Rapid’s DR-1 and DR-2 is that the DR-1 is for larger framed people while the DR-2 is for smaller framed people. The DR-2 is narrower across the shoulders. 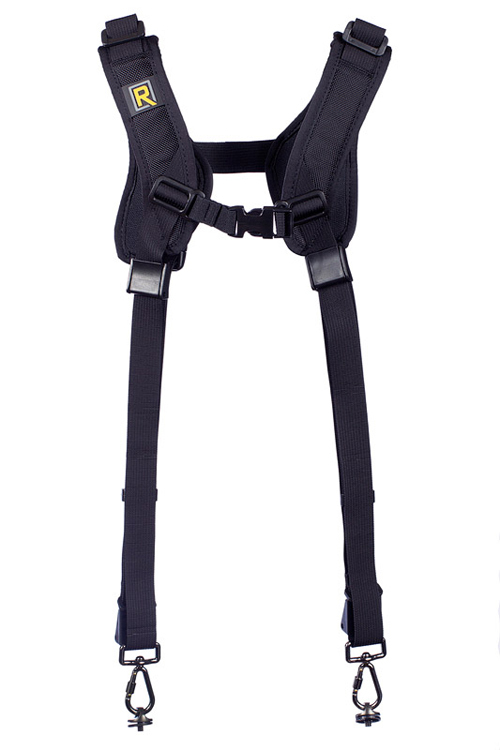 The straps are made from Durable, high quality, ballistic nylon and bomb-proof webbing. When it comes to getting the thing on the documentation could be a lot more thought through. It took two clever people to work out how to construct it and put it on. We watched the demos on the product’s website, which are very amusing but more entertaining than enlightening. We were surprised and pleased at how the straps reduce fatique over other straps. We got used to having both D-SLRS both with battery grips cameras hang at the hip. We didn’t mind the strap shifting when shooting vertical. We tried using one side as a single strap and that worked out OK, except for the need for the under arm tether strap, (which is sold separately) to keep the strap pad from shifting. The DR-2 loses marks only because the price is a tad high and for what you pay it should include the under arm tether strap, we think that’s a sensible expectation to get full utility out of a strap such as this. Besides that, it gives a great accessibility when you need two cameras at the same time. The Black Rapid RS-DR2 Strap is available from Amazon for £119.97. Previous articleNew password system means never having to remember one ever again!